If you like the sound of auto tune on your songs or if you use it for pitch correction like it is intended, you will love this. If you're not already familiar with automatic pitch correction, then here is the way it works. 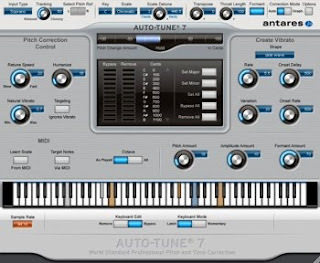 It is simple, you just define your scale (by hand or by selection one of the minor, major, chromatic or 26 historical and microtonal scales included in Auto-Tune 7's library), set the retuning speed (slow for a natural sound, fast for T-Pain effects), and then let the program do the work. For vocalists who use it to actually correct bad notes it is excellent and very natural sounding. By displaying the vocal performance along a piano-roll-style time line, you can easily grab, drag, and correct individual notes. It retails for around $400 but is a wonderful plug-in to work with. For more info visit Antares here. Submit your best tracks on either site. Large radio networks.